From the cloak of Wadi Rum serenity to the nutrient-rich mud from the Dead Sea, Jordan delivers to the heart and soul of travelers. The capital, Amman, was clean, full of tree-lined boulevards. It glittered in the sun because it is built almost entirely of white limestone. They need to issue sunglasses at the airport for arriving visitors. Many women chose to wear headscarves, usually stylish ones in colors to match their business suits. Many did not. I saw only two people with face scarves; they were visiting Saudis. Anyone remotely acquainted with the highlights of Jordan will surely recommend getting out of Amman ASAP and discovering Jordan’s best natural resource’ its rich history and a different kind of peace that extends beyond rhetoric and permeates your being. Sunrise at the village was easily the most peaceful I ever experienced, with nothing but the occasional rooster urging the sun skyward. For a city boy from Los Angeles, this was the closest I had ever been to the heavens. You hear stories of the deep pink rock facades exquisitely carved by the ancient Nabataeans, a hard-working network of Arab tribes who settled the area more than 2,000 years ago. However, it’s safe to write that nothing quite prepares you for the experience of seeing it in person. Petra is astounding. Amazing. Breathtaking. And more. Even without the buildings carved into the side of the mountains, the vast rock formations and canyon walls are worthy of “breathtaking” status. Centuries of earthquakes and neglect have left much of Petra’s history covered in sand and silt, which makes the mystery that much more alluring. 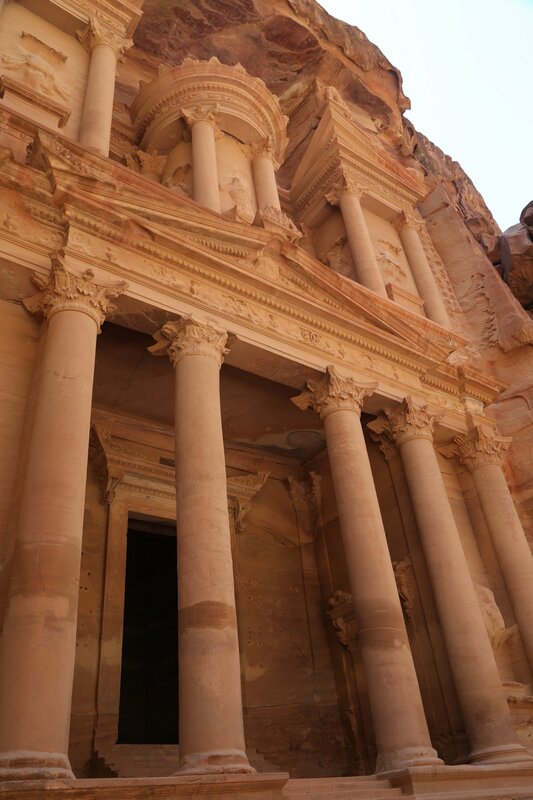 Tucked quietly in the mountains of southern Jordan, between the Dead Sea and the Gulf of Aqaba, Petra was once the strategic location along early trade routes between the Middle East and northern Africa. Its people were some of the original architects, artisans and tradesmen prospering until trade routes changed and the Romans eventually took over. 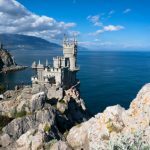 Now a United Nations World Heritage Site, the eroded areas are protected. It’s tempting to succumb to the easy way out and rent a $10 horse to carry you along the rough stone path leading toward a narrow, half-mile passageway known as the Siq. You’ll find the walk easy, and marveling at the towering canyon walls is half the fun. When the Siq finally gives way to the Treasury (aka locally as Al Khazneh) the most famous of Petra’s remarkable facades, your fate is sealed: you’ll never see anything quite like it. Carved into the canyon wall in the first century B.C., the Treasury stands 130 feet high with razor-sharp details, well preserved from wind and rain by the facade’s uneven rock wall. The complex figures and patterns engraved between columns and inside pediments warrant intense scrutiny. While it looks as though it could be a quite comfortable living space, guides quickly reveal the structure as a ceremonial tomb, with the final story alleging that riches were hidden in the urn at the top. Just another reminder that centuries have passed and the mysteries of death and our anticipation of it is the single most intriguing aspect of our life’s process. Scattered through the rockscape are remnants of tombs, which look like open-mouthed caves. The Nabataeans used them for burial sites, with over 800 identified throughout Petra. Hours feel like minutes as you analyze the endless angles of the site, sipping tea if desired at one of the many rest stops. Walking through the center of Petra your mind transports you to ancient times, where negotiation must have ruled throughout the marketplace. One last temptation awaits in Petra: the Monastery. Petra’s other famous facade, Ad-Deir, sits atop a plateau, and most locals tell you it’s a quick 15-minute, 800-step walk to the top. While I’m not a triathlete and not even in the best shape in the world, the Stairmaster is not a stranger to me. The winding trail of narrow steps seem an easy conquest, that is until you count off about 200 or so of them. At that point the $12 mule that could have taken me to the top without the fear of an eventual heart attack looked like a wise investment. Nevertheless, even if you take five minutes longer than most, reaching the top unassisted is very pleasing to the spirit and the eyes. Less ornate than the Treasury, the Monastery is much larger, intimidating the landscape with an imposing stare that leaves your mouth agape. Out of breath, I relaxed in a plastic lounge chair with a Diet Coke, listening to my lungs fill with ancient air, my mind awash with visions of ancient craftsmen building the next tomb. Needless to say, the walk down the slope was infinitely easier, and there was a great story to tell later to those who skipped the hike altogether. Our beat-up 4×4 pickup bumped past titanic stone sculptures of Wadi Rum. The rush of a week on the road and a blur of sightseeing would soon be replaced by silence as our Bedouin guide urged each of us to walk five minutes in opposite directions to find our own piece of the desert. My walk took me to a rock landscape like no other on earth. After a quick climb, I sat and heard nothing. Nothing but my thoughts. For the first time in my life, I heard absolutely nothing. It was as startling as it was refreshing and peaceful. Just me, the earth and the air. Only a passing camel gliding past me with his easy, swinging gait reminded me it was time to rejoin the group. It was humbling to be this close to nature. The warm day gave way to a windy two-hour drive to the middle of Wadi Rum, and starlit silence was imminent. We weren’t exactly roughing it, with Bedouins to help with our bags and a dinner (prepared in the ground) just around the corner. We were shown into a large square tent, where eight others would share the accommodations Bedouin-style, on rugs and cushions. Usually after a long drive, I would check emails, voice mails and send a dozen or so text messages, but none of that was happening here. No phones, no computers, just the age-old art of conversation, as my travel mates huddled in little cliques. The party lasted throughout dinner and Arabian dancing into the midnight hours under intense and unblinking stars. I found a quiet spot and lay back stargazing, waiting for my first shooting star. 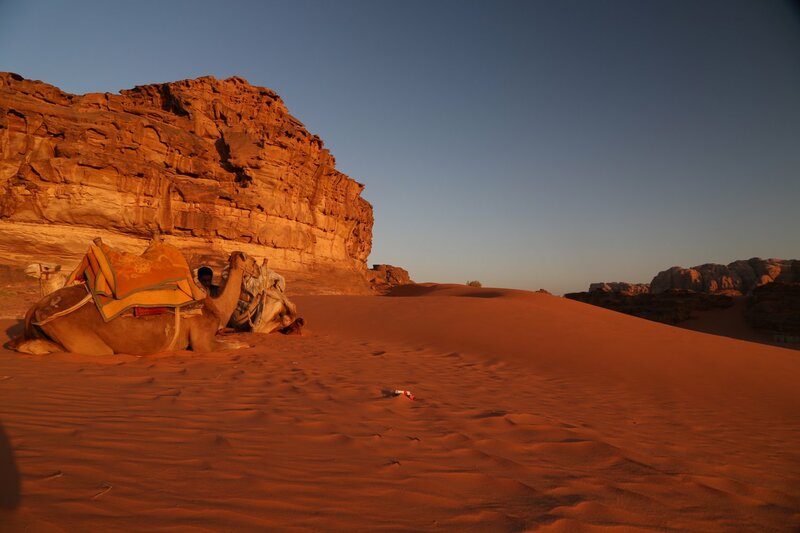 As I watched it streak across the night, wrapped around me was a cloak of Wadi Rum serenity. I still draw on its strength today. Morning came as quickly as the night, and as if an alarm clock were set, I rose around 4:45 well before the sun would appear. Walking out only a half mile, I found my spot to watch the sunrise, and it didn’t disappoint. Slowly in the east the velvety blackness gave way to the deep inky blue of dirty indigo. Then as the sun struggled higher, this became the blue of a new born baby’s eyes, then a softer pink, which brought back memories of fluttering silks in a Tripoli souk, and finally as the sun began to climb majestically over the mountains which shimmered on the horizon, the deep red of traditional Chinese lanterns. A few minutes later, the sky turned the color of freshly picked oranges, and a few white wispy clouds skated nervously across it. The first true golden rays of the sun cascaded over the desert floor a hundred feet below me, turning the frost-covered sand into a sea of fiery diamonds. I sat and watched the rays chase away the last remnants of nighttime, and a new day of life begin in Wadi Rum. The sunrise had been unmistakably beautiful and awe-inspiring. I wanted to shout and let my joy ring around the valleys, but the light looked crystalline and fragile, and I didn’t want this magical moment to shatter around me. The view stretched forever and was colored every shade of the spectrum from red to deep, deep blue. Despite the desolation of the scene and the scarcity of vegetation – only a few spiny trees seemed to thrive on the desert floor – it was a truly beautiful view. It calmed me, inspired me, and I felt at one with the large eagle who soared high above us. Both of us soared, the eagle on unseen thermals and I along with him on the view. I only need to close my eyes, and I am back there once again, speechless in wonder. People travel from all over the world to slather themselves in nutrient-rich mud from the Dead Sea. Legend says it was the Queen of Sheba who first believed in the mystical healing powers of this age old sea. Then Cleopatra traveled from Egypt to build the world’s first spa there, later sending her armies in place of her to bring back their precious minerals. Today, products from this salty sea are a worldwide sensation. The Dead Sea’s main draw, besides being the lowest point on the planet, is its high salt content, which produces incredible natural products and allows bathers to bob like corks on top of the water. Dead Sea water contains 35 percent of minerals per liter of water, and this heavy concentration of over 21 different minerals is believed to help with skin problems like eczema and psoriasis, plus aching joints and even fluid retention. The sea contains high levels of calcium, magnesium, bromide, potassium and sulfate. 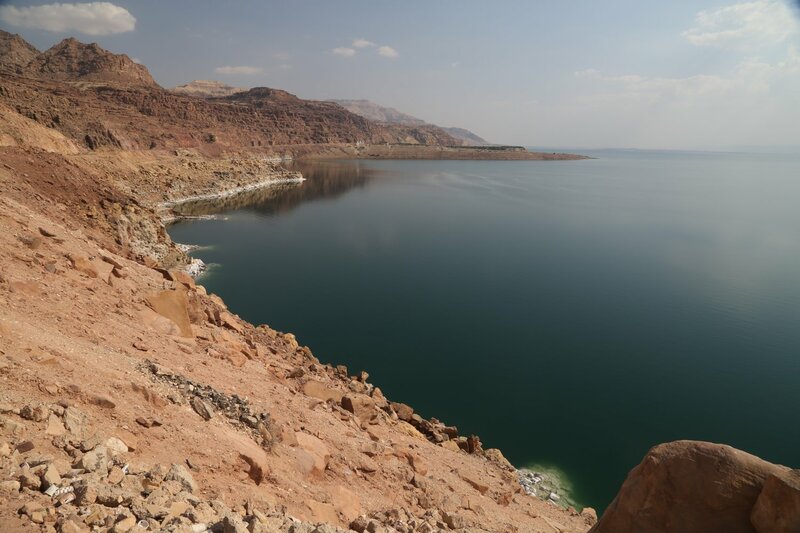 Europeans and Americans alike are discovering or rediscovering the Dead Sea’s famed minerals. Westerners lounge seaside wrapping themselves in the same mud Cleopatra coveted, while they are being duely pampered with a Bedouin sense of hospitality. Once fully caked, your body is cleansed, with the gunk imbedded in your pores magically erased after a warm shoreline shower. Despite the renaissance that the area is experiencing, the Dead Sea still has a sleepy, small-village feel, with locals blending seamlessly with tourists as plumes of smoke rise from nargilas (hookahs) along the shore. Even so, the area is clearly moving quickly toward becoming an upmarket destination, with a vibrant fitness scene, upscale spas sprouting in every luxury hotel and a major eco plan designed to revive the dying (yes!) Dead Sea. So while it’s said that the Dead Sea is the biggest, widest natural spa on earth, three bits of advice: 1. Men don’t shave before taking a dip (women please don’t shave your legs) or you will be in agony from the irritation. 2. Don’t splash salt water in your eyes (for the same reason). 3. Don’t leave your feet in the water too long or you might become addicted to its soothing power and silky baby oil consistency. Before heading back to the airport, I rose at 7 a.m. and took my one and only plunge into the Dead Sea, which was at the temperature of an enormous personal bath; I discovered the meaning of “happy as a clam.” There I bobbed for an hour in Jordan, alone in peaceful paradise. 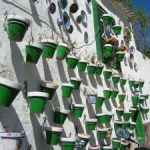 A relatively recent development in tourism, socially conscious “voluntourism” is quickly gaining popularity. So, what is voluntourism? Basically, it unites the best of travel with giving something back to society in return. Travelers get to enjoy the art, heritage sites and the recreation of a destination but also have the chance to immerse themselves in a local culture while serving both the people and places visited. In my Holy Week journey through Jordan, I experienced this practice firsthand at the Al-Hussein Society for the Habilitation/Rehabilitation of the Physically Challenged (AHS). 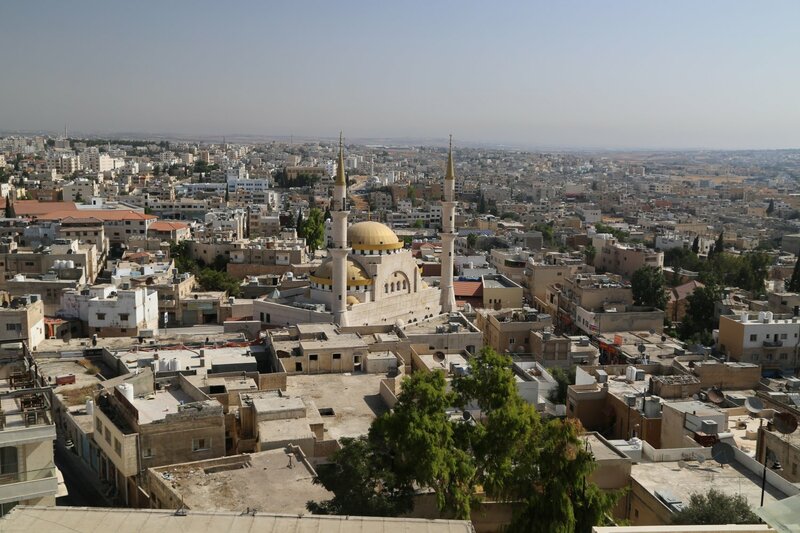 Located in the capital, Amman, AHS offers visitors the chance to volunteer in their everyday schedule of activities. I was quite impressed by the gentle and caring support given by the staff, and the family atmosphere offered there. The facilities are state-of-the-art, and the funding is totally provided through private sources, undoubtedly from the Islamic tradition of compassion for those in need. During my visit, I helped teach an English course for a first through sixth grade class, while others helped in the physical education and music classes. It was such a joy to spend time talking with the children, all of whom had such an indomitable spirit and keen desire to learn. They were every bit as interested in me, an American, as I was fascinated by them. At times it became as much an Arabic class for me as an English class for them. In addition to providing a solid education, the center also has an on-site clinic where orthotic aids are made, wheelchairs modified and rehabilitation care given. As I toured their machine shop, one “voluntourist” traveling with me, helped a young girl to walk with a prosthetic leg for the first time. The willpower shown to accomplish this feat of mobility was simply amazing. My friend later told me this child had captured her heart forever, and she was so glad a place like this is available for that young girl to blossom. After leaving the center in Amman, I traveled 30 miles southwest into the mountains of Gilead. On the summit of Mt. Nebo, where the promise of a new life was given to Moses people, stands an ancient church marking the spot where a new life for the physically challenged is given. Inside this Byzantine church are the famous Mount Nebo mosaics, and down the road is the Madaba Mosaic School. The school was established in 1992 as a center for training in mosaic art and stone restoration, and this year it was upgraded to a college, awarding degrees in mosaic education. With the assistance of AHS, students and graduates of this school use the skills they’re taught in preserving the Mount Nebo masterpieces. Since a limited number of graduates are involved in the restoration efforts, those that are not, create new masterpieces that are sold at the nearby Al-Mukhayat Handicraft Center, which provides an infusion of cash into the local economy. For anyone curious about getting involved in voluntourism, the simplest way is to sign up for a group experience with a tour operator specializing in it. The International Volunteer Programs Association estimates that 50,000 to 75,000 Americans will have done just this in 2007. That leaves the corollary of this question, “Can I experience voluntourism on my own?” The answer is a qualified yes. While unplanned and independent volunteer service is more commonly available in developed countries, the unplanned opportunity is possible but not as available in developing countries. I suggest contacting one of the agencies below as a great place to start. Whichever way he chooses to do it, in a group or independently, the experience will forever alter a visitor’s connection with a destination and its people. This is travel with a purpose, a journey that replenishes the soul.